I am traveling this week for work and my first stop is Portland, Oregon. I have never been before so I was excited to see a bit of it. Walking around this evening, I was struck by how many food carts I saw. One here and there and sometimes all parked together in a lot. One in particular caught my eye - Korean BBQ, Bugogi Tacos! My coworker Beth and I continued on however to Mother's Bistro. I asked folks on Twitter for Portland recommendations and this was one of them. They advertised a mac and cheese of the day and I was sold. They also had a variety of fries of which I chose the white truffle fries. Heaven! I was kinda surprised to see how early everything closed. We just made it to Mother's before it closed at nine, none of the food trailers were operating and when we tried to stop at Stumptown Coffee Roasters it was already closed by nine. Check out notmartha.org. She just posted about the food carts in Portland. If you get a chance, visit Saint Cupcake. Their cupcakes are the absolute best that I've had. Also, if you get a chance, ride the Max to the stop underneath of Washington Park. There's cool stuff down there. Have fun in Portland. I love, love, LOVE that city!! I went to Portland a few weeks ago and found http://www.foodcartsportland.com/ a great resource for finding delicious food trucks, and giving me some keen advice, always bring cash!! Yeah, unless you're headed to a nightclub or something, we tend to close early here in the PacNW. Are you going to hit Seattle too? I second the saint cupcake. I think you should check out one of the McMennamins restaurants. 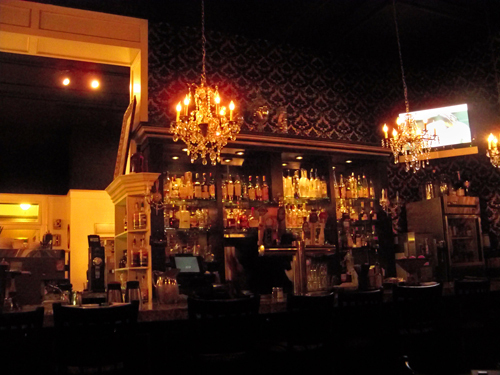 They take old historic places and make them into restaurants, movie theaters, and hotels. The Kennedy School is a good one...and most are open late. 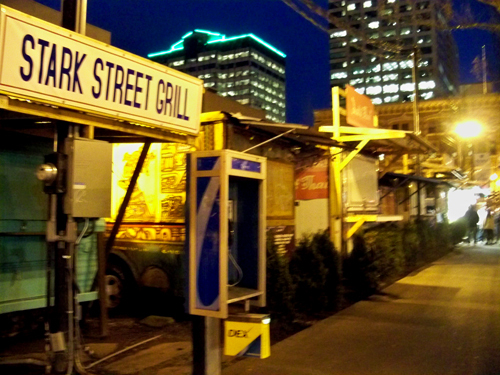 If you are still in portland, take a trip out to the Grilled Cheese Grill! It's a school bus turned restaurant that sells grilled cheese sandwich! Not sure how much longer you'll be in PDX, but you should try one of my faves, St Honore Bakery. http://www.sainthonorebakery.com/ Freaking awesome! And I'd suggest McMenamins too...I know you're not much of a drinker but you should at least try a glass of the Ruby (a raspberry wheat beer! )...it's delightful! And you have to hit Powell's, it's an institution.